When a child is sick their world comes to a halt. They will feel scared and alone, especially if they are unable to see their friends. The Self-Esteem Angel and Little Angel Aain help George deal with his fears and keep his illness in perspective. Your children will learn simple solutions on how to cope when they do get sick. 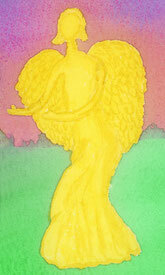 “What did you tell him about dealing with this kind of a change in his life?” asked the Self-Esteem Angel™. “I told him that his friends would still be there when he was well again. I told him that having an illness does change a person’s life in many ways. His day-to-day routine will be different and depending on how long he’s sick he might have to make some adjustments in his life,” explained Aain. “He told me that it was okay to be scared that everyone is scared of not knowing what’s wrong when they get sick,” said George. “Some people say the waiting and not knowing is sometimes harder to get through than the actual illness. What does it feel like in your body when you are scared?” asked the Angel. “Sometimes, I feel like my stomach is doing flip flops and sometimes it’s just ‘butterflies,’” said George. The Self-Esteem Angel™ exclaimed, “Well! I guess we better get those butterflies to fly in formation!” They all laughed as they imagined butterflies flying in a formation like geese do. What is making George sick? 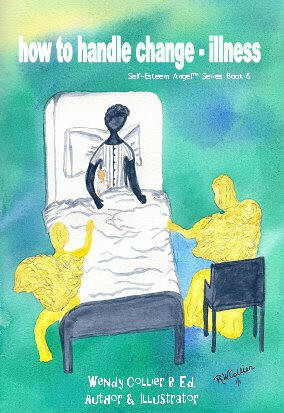 Will the Self-Esteem Angel™ and Little Angel Aain be able to help George feel better? Search for the gems of knowledge that George discovers to help him successfully handle being sick. Read How To Handle Change - Illness so you’ll know what to do when you get sick.